The Derwent Inktense Wooden Box contains 24 Derwent Inktense Pencils in a compact, functional yet beautiful maple box. 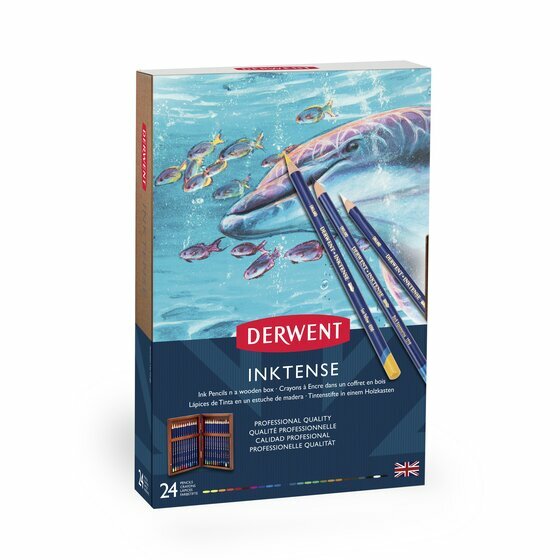 Derwent Inktense pencils are our best watercolour pencil ever. You can use them dry but mix them with water and WOW, the colour turns into vibrant ink! Pencils colours: Sherbert Lemon, Sun Yellow, Tangerine, Poppy Red, Chilli Red, Shiraz, Fuchsia, Violet, Iris Blue, Bright Blue, Deep Indigo, Sea Blue, Teal Green, Apple Green, Field Green, Leaf Green, Mustard, Baked Earth, Willow, Bark, Charcoal Grey, Ink Black, Antique White and Outliner.